SMS is the preferred communication channel for many due to its ease and simplicity. Ubiquity ‘Smart Messages’ ensures 100% of leads generated contain a valid mobile number. No integration required. Campaigns can be run independently of existing eCommerce, website or CRM systems, with leads fed back to stakeholders in real-time. SMS lead generation campaigns can be used by Insurance providers to improve customer satisfaction and NPS and reduce churn while cost effectively acquiring new customers. SMS Lead Generation helps retain customers for your physical or online store. 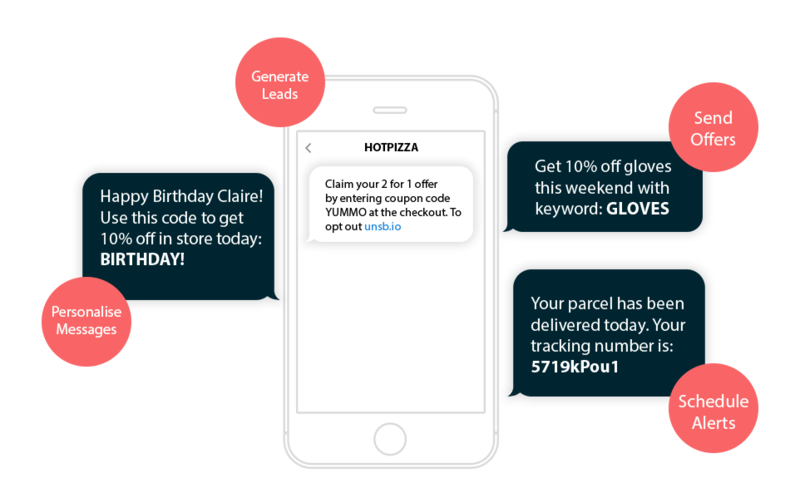 Add SMS lead generation campaigns to your customer’s marketing mix. Boost sales and achieve immediate ROI. Start growing sales today with no need to integrate into legacy and cumbersome business systems. Import CSV or Excel files and export captured leads to add back into master databases. Increase conversion rates by sending campaigns around the world from a branded Sender ID, wherever it is supported. Branded Sender ID’s increase recipient confidence and are therefore more likely to take action. Create master and sub group lead lists that allow you to later target large groups and subgroups within them. Track efforts and success in real-time with granular level reporting. See campaign deliverability, open rates, location, and more. Build complex applications on our text messaging platform. Access more data and statistics, automate marketing processes, signups, and more.